I have just one more card for the WPlus9 June Release. If you missed it, the official release day was on June 5th and all of the products are available at WPlus9! This last card features Main Squeeze. 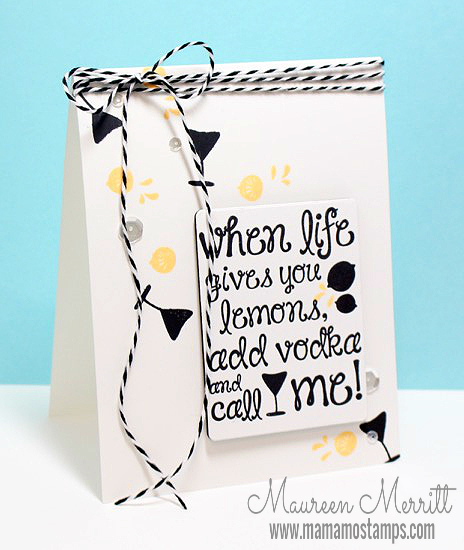 I love this fun party/pick me up/main squeeze set. I can see using the glasses with silver embossing powder for New Years, a 40th birthday, a retirement or some special occasion like that! Just switch out the sentiments and you've got a set for any celebration! I sure do hope that you enjoyed my release posts this month. It's been a blast creating with all of the new products!!! I'm looking forward to seeing the June release popping up on challenges and design blogs. Thanks for your comments throughout the past week and all of the pins on my Too Much Cuteness cards. I makes me so happy to know I am inspiring others! Super cute. I love the black and yellow together. This is so FUN!! I LOVE the colors you used and that sentiment-just adorable. Fabulous design!